LIMERICK ARE ON the hunt for a new senior football manager following Maurice Horan’s resignation. The Treatymen crashed out of the Championship last weekend after losing to Longford and Horan informed the county board today that he is stepping down after three years in charge. 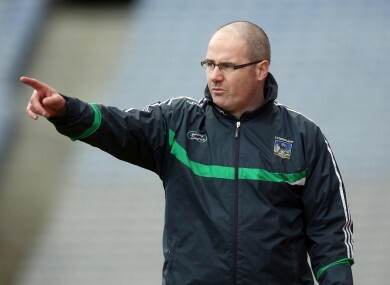 “While disappointed with his resignation Limerick County Board & Limerick Football Committee fully respect Maurice’s decision and would sincerely like to thank him for his 100% commitment and loyalty to Limerick football over the past four years and wish him and his family every good wish for the future,” the county said in a statement. Horan’s tenure will best be remembered for a remarkable Championship run in his first season where Limerick battled their way into the 2011 All-Ireland quarter-finals before losing to Kerry. He led the county to the Division 4 title and league promotion this spring but Limerick fell at the first hurdle in the Munster Championship, losing by 18 points against Cork and then exiting the qualifiers at the hands of Longford. “They have given so much in their desire to bring Limerick football to the top,” Horan said as he thanked his players today. “They enjoyed great days – such as the 2011 win over Wexford, and the historic Croke Park appearance – and I hope they will look back on their period in their footballing careers with fondness. Email “Maurice Horan resigns as Limerick football manager”. Feedback on “Maurice Horan resigns as Limerick football manager”.